Each year microbreweries become more and more popular. What better way to get to know Alaska locals than by sitting elbow to elbow and sampling some one-of-kind Alaska brews? Next time you visit Alaska, call a taxi and have some fun on a pub and microbrewery tour in Anchorage. This quickly growing microbrew is also one of Alaska’s newest, founded by brewer Gabe Fletcher, former head brewer of Midnight Sun Brewery. It moved from its location downtown, where it shared some equipment with Sleeping Lady Brewery, to its new location at 148 W. 91st Street in November 2014. The outdoor beer garden features fire pits, helping keep patrons toasty during the winter months. Anchorage Brewing Co.’s ale is brewed in spices and aged in French Oak wine barrels. The brewery offers exotic concoctions such as Galaxy White IPA, which is brewed with fresh kumquats, Indian coriander, and black peppercorns. From 91st Street, head north on King Street to 7924 King Street. This microbrew, founded by Shane Kingry and Dana Walukiewicz in 2011, offers a Beer of the Month, seasonal brews and special flavors like the tart and dry King Street Cherry Wit, fermented with more than 500 pounds of cherry puree. The brewery’s taproom is open from 2 p.m. to 8 p.m. daily and noon to 8 p.m. on the weekends. Head south again on King Street to E. Dimond Boulevard, which becomes Abbott Road once you pass the Seward Highway. Turn north to 8111 Dimond Hook Drive. The loft is open from 11 a.m. to 8 p.m. If you’re interested in a brewery tour, Midnight Sun offers them every Thursday at 6 p.m., no reservations required – just show up in the loft. Guests of the tour not only will see the brewing and packaging process, but also get free samples of new beers. The brewpub also has a menu of salads, sammies with slow-roasted pulled pork, appetizers, and meat plates. Midnight Sun also features exhibitions of local artists monthly. Now it’s time to head to downtown Anchorage to visit one of Alaska’s most established breweries which claims to be “the hot spot on a cold Alaskan night.” On the Seward Highway, head north. Glacier Brewhouse, 737 W. 5th Avenue, Suite 110, has been operating in the heart of Anchorage’s downtown area since 1996. Founded by Chris Anderson and Bob Acree, and ranks in the top ten of brewpub beer production in the U.S., producing 4,500 barrels of draft in 2012, half of which was sold on site. The brewery specializes in oak aging, selecting barrels for the qualities they carry, such as previously carrying Chardonnay or Jim Beam. The pub’s gourmet menu includes gluten-free options. Reservations can be made on the brewpub’s website. Humpy’s is short walk a block and a half away from the Glacier Brewhouse. The brewpub showcases local music every Friday and Saturday nights, open mic night on Sundays and a summer concert series. It celebrated its 21st anniversary in 2015. It offers a full menu including Alaska King Crab. The brewpub also has a sister location in Kona, Hawaii. Head a few blocks north and you’ve come full circle. Sleeping Lady Brewery, 717 W. Third Ave., used to share some equipment with the fledgling Anchorage Brewing Co. before the new brewery moved to 91st Street. 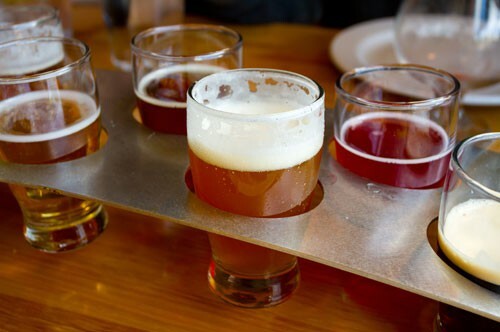 The Sleeping Lady Brewery and Snow Goose Restaurant offer local entertainment, Alaska cuisine and World Beer Cup winning pale ales. Its porter and barley wine beer have been nationally recognized. The brewery also makes a tasty, old-style Sleeping Lady root beer. Whether you’re staying in the city or nearby scenic Kenai Peninsula, catching a ride to these special homegrown Anchorage brewpubs will leave you with a special taste of the 49th state.